The path that led us to The Brent Woodall Foundation started with an evaluation from Early Childhood Intervention. It was decided that Chris, at 17 months, was really only at about a 7 month level in his communication abilities. I took this so much for granted with my daughter, who is my poster child for typical development. So we were told to get his hearing checked, and start interventional services to “catch him up.” In a nutshell, Chris basically didn’t speak nor did he let his needs or wants known. He did not imitate. He did not gesture. He barely babbled. He wouldn’t look at anyone for more than a second at a time. He didn’t show us toys. He didn’t point. After getting his hearing checked, we learned he had quite a bit of latent fluid in both ears resulting from a prior ear infection. Tubes were inserted into his ears, the fluid was drained, and his hearing was restored. While we are confident that the hearing improvement helped Chris’ ability to understand simple commands, it did not do all the other wonderful things for him that were expected in regards to his development. Kids with hearing loss can still tell you what they need or want, in their own way. Interventional services started with ECI, but after assessing him at his 18 month check-up using the CHAT test, my pediatrician recommended taking Chris to a developmental pediatrician. I remember taking this same 9 question assessment with my daughter when she was his age, quickly checking off yes to all 9. When I filled it out for Chris, he only had 2 yes answers (likes being swung around and likes to climb up stairs). Everything else was no. I stared at it, wondering what this all meant. We visited with a developmental pediatrician in late September, and after spending an hour with us, the doctor told us to come back for a formal evaluation. We left feeling ready for the full evaluation, but both of us were still saying to ourselves that this isn’t, wasn’t, couldn’t be the outcome. At this point, I did some research on toddlers with autism, and one thing I want everyone out there to know is with all the current advances in autism research, it is now possible to place a child on the spectrum well below the age of 2, even as young as 18 months. The sooner they are diagnosed, the sooner treatment can begin. And guess what—GOOD NEWS ALERT!! !—kids that have earlier intervention are shown to not only lessen their symptoms, but some even lose the diagnosis all together. Around this same time we had started Chris in the same pre-school program that our daughter attends. It did not go well. This was also a concern for us, because we had him evaluated by his ECI therapist at school, and she told us he was basically lost in that environment. He cried non-stop, would not participate, wandered the room, and had nothing to do with the teachers or other kids. Knowing what we know now, this also points very directly to his eventual diagnosis. 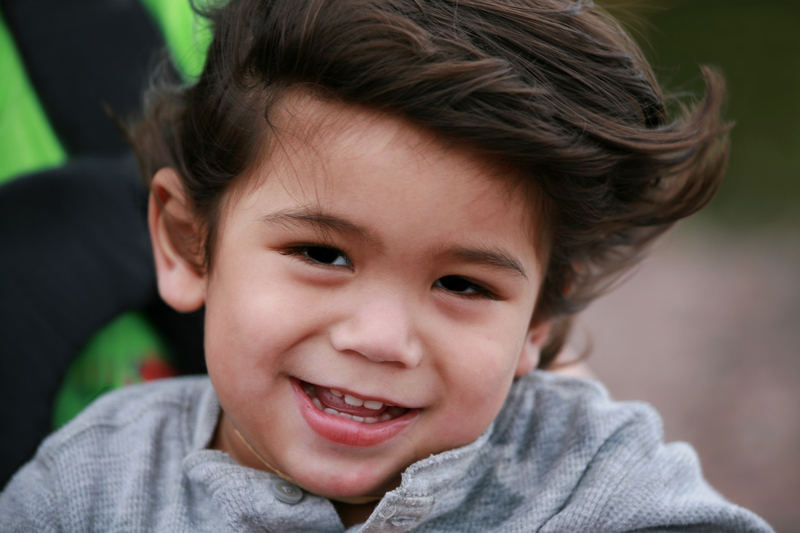 After the formal evaluation by the developmental pediatrician, Chris was diagnosed on the spectrum at 19 months old. At this point Chris was getting 30 minutes a week of play therapy (trying to improve eye contact, get more interactive play out of him, use words or gestures to communicate). His prescription for autism treatment: 8 hours a week of ABA therapy. Here marked the beginning of a very stressful few weeks of deciding what to do. I spent several hours that day researching, and quickly found out that our health insurance does not cover ABA therapy (nor do many of the insurance companies in the US). It would have been possible to continue using ECI for interventional services (including ABA) and do it for practically free, but our experience with doing in-home therapy was not very helpful for Chris, so we decided to keep forging on and find somewhere that Chris could physically go to every day for help. Also, knowing about Chris’ difficulty in pre-school made us want to send him somewhere for “school” to get him out of his comfort zone, rather than keep him in his little bubble at home. The doctor said, “If your insurance won’t cover ABA, call the Brent Woodall Foundation in Irving. They offer ABA at an affordable price.” This one statement from him would change our course and lead us down a path full of hope and caring. I called BWF, and yet another evaluation was in the works, this time to decide how often Chris needed to attend therapy. I had convinced myself he would only need one or two days a week of therapy, and when the report came back that they wanted him to be in therapy 5 days a week (10 hours total), I was devastated. Here was yet another person who I thought for sure would tell me that this is all a mistake and to get back to a normal life. That didn’t happen. I was just waiting and waiting for some professional to disagree with all of this, but that day never came. We also saw a pediatric neurologist who ran a genetic blood test to check for abnormalities, which came back totally normal. He also reviewed the Developmental Pediatrician’s diagnosis report and said he respected this physician and agreed with his findings. We made a plan with the Brent Woodall Foundation and signed Chris up. He began therapy in the beginning of November. When he started ABA, he was also going to private speech therapy once a week. He was evaluated by the speech therapist for his communication abilities, and they placed him in the bottom 1% of all two year olds. After being in ABA therapy and speech therapy for a few months, we really saw positive changes in Chris. He was able to point at lots of different pictures in books. He called us Mama and Dada by the following spring. He was starting to look at us for a moment when he wanted something. He learned how to request certain foods or toys he wanted. He was using a few words functionally, and could repeat lots of words when prompted. He would tell us whether he wanted Mama or Dada to read him a book by grabbing one of us. They were such simple things, but great accomplishments for Chris. What these accomplishments showed us was that he was transferring the information he learned in therapy to his life at home. And that meant that it was working. Over the course of the spring and summer, the changes we saw in Chris were just remarkable. He amazed us, his therapists, and our family members with his blossoming personality and communication abilities. In August, we returned to the developmental pediatrician for a follow-up appointment where they performed the same evaluation that had been done the previous October. The Dr. was very pleased to tell me that Chris no longer qualified for the spectrum diagnosis! I was floored and SO VERY THANKFUL to everyone who had helped our son, especially everyone at the Brent Woodall Foundation. What this organization does for families dealing with autism and other developmental disabilities is simply extraordinary. Not only do they give each and every child the specific attention they deserve, they do it in a way that gives you hope for the child’s future. Chris continued ABA therapy for a couple more months, while he was transitioning into Montessori pre-school a couple of days a week. As of this November, he no longer attends ABA therapy and is in pre-school full time and gets speech therapy a couple of days a week. We couldn’t be more proud of Chris, and owe it all to our friends at The Brent Woodall Foundation. Thank you!!!!!!! !